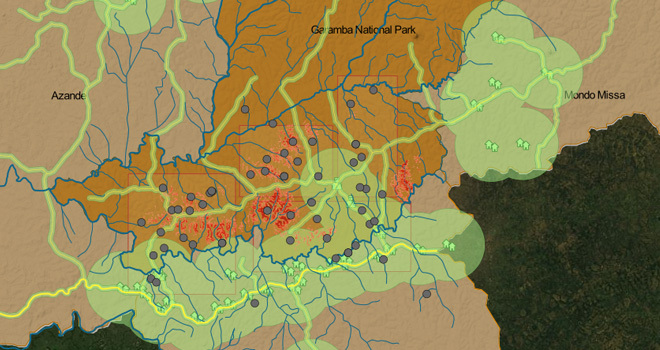 This report is a follow-up to a report produced in 2013 by the Enough Project, The Resolve, Invisible Children, and the Satellite Sentinel Project, with DigitalGlobe’s assistance, that described how the LRA poaches elephants in the Democratic Republic of the Congo’s Garamba National Park. It seeks to use satellite imagery and predictive analytics to assist the park’s rangers to level the playing field with the poachers and better protect the dwindling elephant population. Since the 1980s, the Garamba elephant population has fallen to about 2,400 from approximately 20,000, largely due to poaching. This effort to use the latest technology to better equip rangers to protect elephants is currently being tested in Garamba, but if the partnership with the park’s rangers is successful, it can be replicated in other parks across Africa. The slaughter of African elephants for their valuable ivory has reached the point that according to the World Conservation Society (WCS), 96 elephants are killed each day. WCS’s 96 Elephants coalition, of which the Enough Project is a member, estimates that poachers killed 35,000 elephants in 2012. The pace of poaching is putting pressure on a continental elephant population that has declined by more than 50 percent in the past 30 years. Ivory prices have reached a record high because of high demand in east and southeast Asia, especially China. On the black market in Asia, elephant tusks are valued at $1,000 to $1,300 per pound. With adult male elephant tusks weighing roughly 135 pounds and adult female tusks weighing 20 pounds, a single elephant tusk can sell for $20,000 to $175,500 on the Asian market. Groups involved in the smuggling of tusks from Africa to Asia pocket the majority of this revenue, as they pay regional poachers around $23 per pound (or $50 per kilo) and then sell the same tusk to middlemen for roughly $200 per kilo.